Original first page of this website created by Peter Darby - December 2000. AUSSIE ROAD RACING - NOT SPEEDWAY, BUT INTERESTING ! It's a separate Brian Darby website. After you have had a chance to view all of the different pages on my website Vintage Speedway I would appreciate your comments in the Guest Book above. Click here to view the midgets of the 1930s and 40s. of Vintage and Classic Speedway machines. Brian Darby and Q5, the ex Bill Goode Falcon Special. The ex Veteran Speedway Riders' Association of Australia website. NOW AustralianSpeedway Riders Association Inc. This is a link to a separate website. An exciting website just for Midget Speedcars. ex midget racer Mel Anthony. A page that takes you via several of my websites with Profiles on Champion Riders and Drivers of the past. of this great new Speedway magazine from the U.K.
Organize your subscription NOW ! Join one of the Vintage Clubs NOW ! A page for viewers of the Vintagespeedway website to post their vintage and classic Speedway photo collections. Just email me the photos in jpeg and if the quality is good enough I will post them on a page under your name. A collection of great early Sidecar pics for the Sidecar fan. Another great Norm Dean photo...thanks Norm. If you like the sound of racing cars, Speedway bikes or midgets in action, click on the heading above for a treat. For the fans of modern and vintage Speedway - I've created a series of photo and action video DVDs For Sale at realistic prices, the range of which can be viewed by clicking on the Speedwaypics heading above. The Vintage Speedway Magazine ( since 1993) and also the Backtrack Magazine. This Classic Speedway magazine actually replaces The VintageSpeedway magazine ( now discontinued )and although still covering very early Speedway takes us into the 50s and 60s etc. Great photos, gloss paper and features by top writers. Priced at 4 Pounds (British Pounds). To purchase click on the Backtrack banner below. If you have any clean old Speedway programmes or photos you don't want or no longer need. Please don't throw them out ! I can use them in my research for the Vintage Speedway Websites I have created. I'm happy to pay postage costs. A website for Sidecar racing of old. A new webpage showing the plaques placed by the Vintage Speedway Clubs at old Speedway sites around Australia. Story by Historian - Brian Lear. This poor little bloke has been getting run over for nineteen years now ! A collection of rare photos of one of our dirt track pioneers of the 1930s, Charlie Spurgeon. A collection of fabulous Speedway rider portrait Post Cards from the 1920s - collected by the late Maurice Hansen of Brisbane. My website with photos from local and overseas Vintage Speedway events. A completely new website where you can purchase A4 SCANS (mailed out ) of rare and some original Speedway programmes. AN EXAMPLE OF A TYPICAL SCAN SHOWN on the Rare Programmes page. A true Aussie Speedway pioneer. A webpage created in remembrance of some famous Speedway personalities. 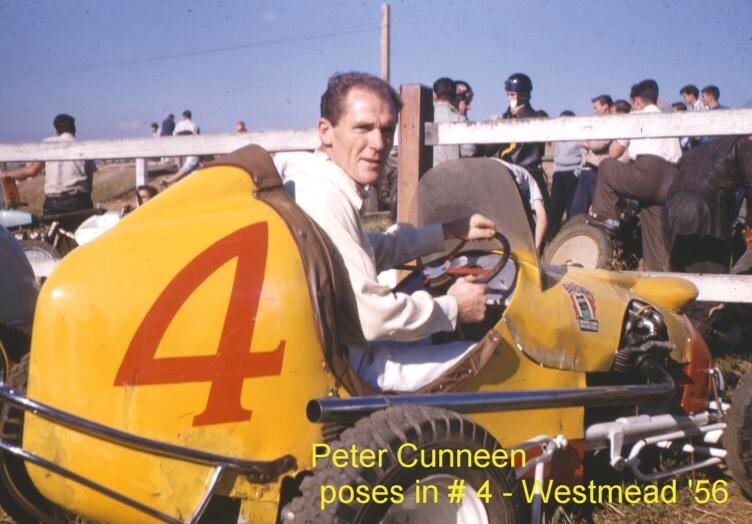 If you love old time Solo Speedway photos - click on this heading - International Solos - in the UK. Click here to view my NEW website. A personal website of mine. Noting my experience in the Automotive Trade, my Speedway hobby and experience with road racing cars, Speedway photography & vintage midgets. Also some motor sport memorabilia For Sale. My entire hard copy Speedway photo collection is FOR SALE. Click on heading to view site. For Video Clips - Vintage Speedcars click here. It's on another of my websites. Alan Streader - Bill Shevill - Sid Middlemass Tribute meetings at IIlabo in 2017 and 2018. now on line on my website. A page of photos as a tribute to Speedway photographer and publisher Bill Meyer. By popular request this page for updates and additions to my websites is now back on line. Allan Whitfield Roper -aka - Allan Blackburne - one of our true Aussie Speedway legends. Click here to view his details & history. Click here to view this unique collection of Aussie Speedway history. A Brian Darby website to pay tribute to our Aussie pioneer Solo riders. For photos from the March Illabo Vintage Speedway Bike & Car meeting click on link below. Click here for NEW 2019 Calendar..
For the May Meeting at ILLABO , Regs, Entry Form and details click on this link. Two Australian motor racing legends. 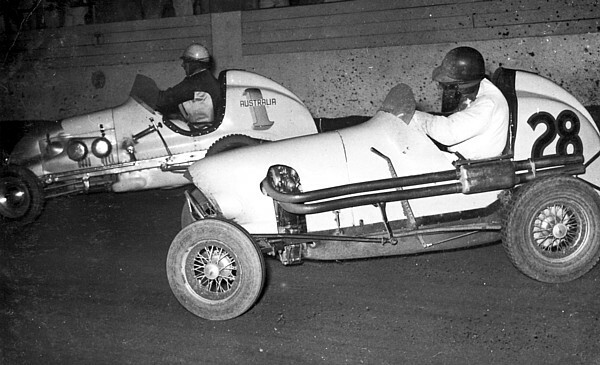 Ray Revell in his Offenhauser Australia # 1 Midget and Jack Brabham in the Ron Ward built Twin JAP engined # 28 Midget - at the Sydney Showground Speedway early 1950s.